Paul Yandell’s son Micah, asked me to post this recent photo for your viewing pleasure. It shows variations of the single cut Country Gentleman from Paul’s original collection. All of them show signs of Paul’s never ending curiosity to try out different ideas. A real “what if we do ___” kind of guy. The one on the left has the special pickup Paul designed that combines the standard Filter-Tron with Super Tron now marketed by our TV Jones (as the Duo-Tron) as well as the Classic Plus (8K) bridge pickup. TV started making them. The wiring harness is TV Jones. It also has a device known as the Chaput “Sta-Tuned” mounted on the Bigsby. It was a fine-tuning gadget designed to stabilize the tuning at the Bigsby. Paul said it worked great but it may no longer be available. This guitar also has a clamping device near the nut that Paul devised to further help stabilize the tuning. These two items are discussed in greater detail in the book. 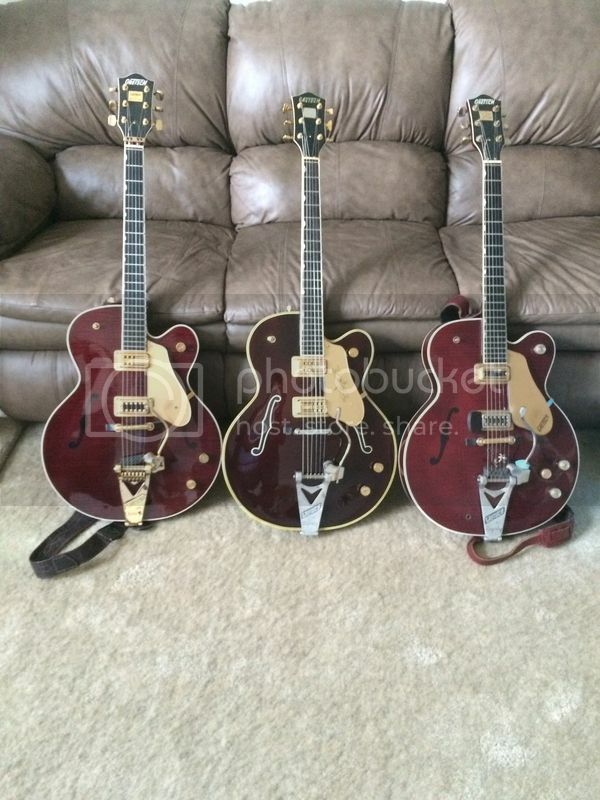 The one on the far right again looks like a 6122-59 with a tone knob added and what looks like a Compton bridge. Paul spoke well of the Tru-Arc bridge but there is no way to tell if one is used on the other two guitars. As far as I know the Country Gentleman’s never came in a three knob configuration so it was probably something Paul decided to try. The blue pick on the Bigsby handle is Paul’s. Micah leaves it there as a memento to his father. The two outer guitars have dark grey foam material in the Bigsby harp section to quell overtones. Micah says this was his dad’s main guitar when he played his ten year stint with Kitty Wells. Micah said that Art Wiggs recently finished restoring it. That guitar went through its own share of modification while Paul had it. He got it when he got discharged from the army. His heavily modified 6120 had been broken in transit getting shipped home from Germany. Consequently he bought this one, S/N 30438, which puts it early (1959) in the run of Gentlemans but Paul may have actually purchased it in 1960. The first thing a gretschaholic will notice is the pickguard. It is like a 6120 signpost pickguard…definitely not standard. At the time of the restoration project, Gretsch didn't have any regular Gentleman pickguards available, I'm planning on putting the original pickguard back on it as soon as it arrives. When I first got the guitar back, Dad had put double position markers on the fingerboard, top and bottom. I had to make some decisions concerning the guitar, so I opted to keep it as close to what he had as possible but upgrade it to the modern style. I know Dad would have done the same thing. He liked vintage, but like the modern as well. Norm, when I got it back, the top was so butchered up with Gibson pickups and extra knobs, the top had to be replaced, I wish you could hear Art's story about all the things that were wrong with the guitar..
As far as the white lined F holes, that was my decision when restoring the guitar, Dad really liked the Hall of fame with the white line f holes. Art and I talked about it and I decided to use the white line f holes with the restoration project to give it character. Like I mentioned, he really like the modern changes... I know the guitar will never be considered mint condition. This was more about what dad would have done. Although Micah’s information (and some of those modifications) are too recent to have been included, Paul himself discusses the development of the 6122-59 and the Duo-Tron pickup in the book "Paul Yandell, Second to the Best … a Sideman’s Chronicle" available for pre-order at your favorite book venue. Many thanks Norm! I am anxiously awaiting my copy of your book.